The information below is taken from a Walker-Turner service bulletin that dates from about 1961. Type 0: No serial numbers. Early machines did not have any serial numbers. Type 1: The first serial number system began in 1939, although not all machines had them that year. These followed no logical pattern and were more akin to a model number than a unit-specific designation. Some of the numbers indicate the year that the model was introduced (not necessarily built) as the last two digits. See the machine-specific section below for details. Note that although the original document lists serial numbers with dashes, the numbers that were stamped onto the badges often used a space instead. Early Type 1 tag. 900 series drill press, serial 9DP1040. Contributed by Dan Hoenish. Typical Type 1 tags. BN905 bandsaw, serial 19-639, contributed by Mike Wiggins. BW740 bandsaw, serial 29-449, contributed by Rich McGowen. 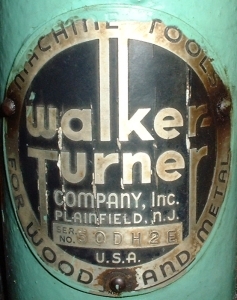 In 1948 Walker-Turner was sold to Kearney & Trecker. At some point thereafter the tags were changed to read "Walker-Turner Division of Kearney & Trecker". Kearney & Trecker era Type 1 tag. TA1180BN tablesaw, serial 161149. Contributed by Mark Ebarc. Type 2: Starting in April of 1950 a new system was introduced. These new serials are formatted YYTSQV where YY is the year of manufacture, T is the type of machine, S is the specific model of machine, Q is the quarter of the year of manufacture, and V notes variation from the standard model. For example, 52DA2A is a standard (52DA2A) single-spindle (52DA2A) 15" drill press (52DA2A) that was built in the 2nd quarter (52DA2A) of 1952 (52DA2A). Details about the second letter code ("S" above) is included in the machine type breakdown. Below is a list of the machine type code letters ("T" above) and what they stand for. Typical Type 2 tag. 900 series drill press, serial 50DH2E. Contributed by Joe Wells. Type 3: The next serial number system was introduced in April 1953 and used through September 1956. Each machine was numbered 0000001, 0000002, etc. The type and model cannot be identified by the number alone. Machine tags used during this time included fields for both Model No. and Serial No. Almost all of the models sold during this time were introduced in 1953. Typical Type 3 tag. 1216-41 drill press, serial 0000381. Contributed by Neil Bellenger. 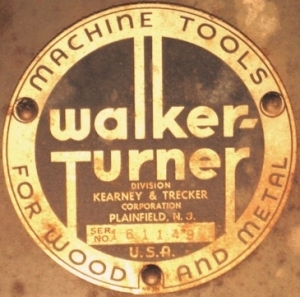 In May of 1956 Kearney & Trecker sold its Walker-Turner Division to Rockwell. At some point thereafter the tags were changed to read "Walker-Turner Division of Rockwell". It is currently unknown if this change occurred before the start of Type 4 serial numbers. Type 4: The last serial number system began in October of 1956. The machine type is designated by a two-digit prefix, e.g., No. 11-0001 was the first 20-inch drill press as of October 1956. Details on the two-digit prefix, when known, appear in the machine type breakdown. Typical Type 4 tag. 1100 series drill press, serial 11-3579. Contributed by Charlie Wells. This system continued until Delta/Rockwell's serial number system replaced it. 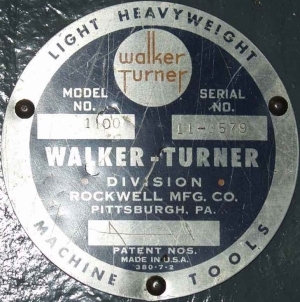 Walker-Turner machines with a Rockwell serial number badge should be dated according to the Delta Serial Numbers page. 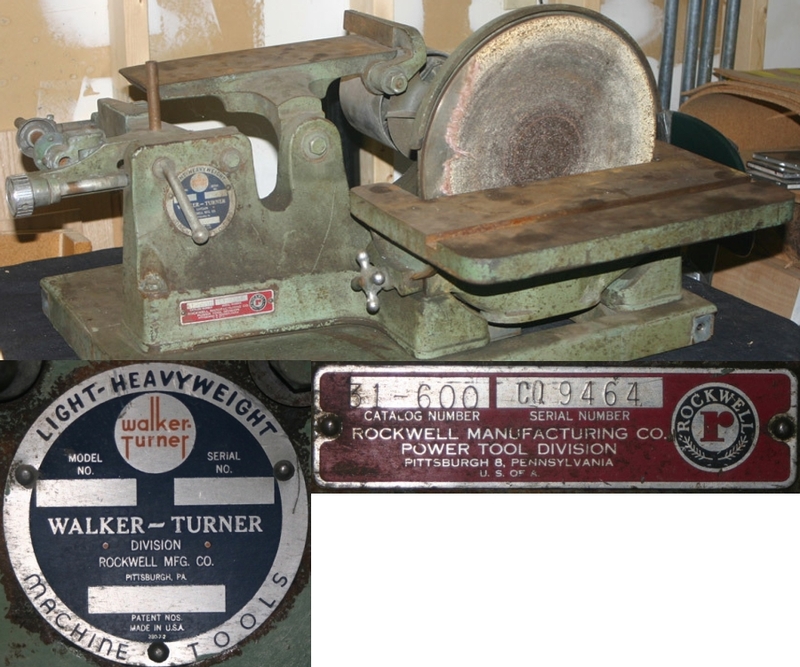 Most Rockwell built Walker-Turner machines came from either their Bellefountaine or Tupelo plants. 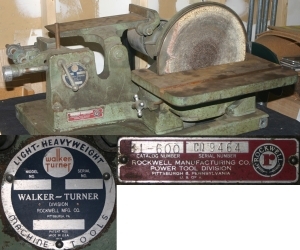 Example of a dual Walker-Turner / Rockwell badged machine. Note that the fields on the Walker-Turner tag are blank. 31-600 sander, serial CQ-9464 which dates to 1961 per the Delta Serial Numbers page. Contributed by Rich McGowen. The following subsections provide details of serial numbers for each type of machine made by Walker-Turner. Information that we have for each machine model is divided into the serial number Type that its production occurred within. Each model number will be followed by its manufacturing dates, then by serial numbers used. Each serial number is linked to an example in the VintageMachinery.org Photo Index when one exists. * At the time of writing, the only Type 1 drill presses in the Photo Index have serial number 9DP1040. None have been entered for 9DP140, 9DP943. 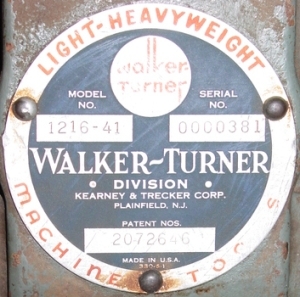 The original Walker-Turner serial-number document gave the codes as 9D140, 9D1040 and 9D943 but we assume that , in fact, the code DP and not D was used to indicate the 15-inch drill press. For units with the Type 2 serial numbering system, the second letter indicates only the number of spindles or the type of spindle in the original unit. All units in this system were of the “900” series until the “1200” and “1300” series were introduced in the second quarter of 1952. The first “1200” series Drill Press was serial number 52DA2A which indicates “52” as 1952, “DA” 15” Drill Press, “2” second quarter and “A” standard model. The “1300” 6” travel 15” Drill Presses are identified through the use of an “O” in place of the “D” in these serial numbers. Note: The original document also mentions serial numbers "59EA2A thru 52EA1A" in the Type 1 section. For units with a Type 2 serial number, the second letter indicates only the number of spindles in the original unit. These 20” Drill Presses began with serial number 52EA2A which indicates “52” as 1952 year of manufacture “EA” 20” Drill Press, etc. All Serial numbers prior to 52EA2A were Type 1. Thus serial number 50BB2A would indicate that it was a model MBN935. Serial number 50BF2A indicates model MCB1160, etc. * RD1170 Radials differ from RD1175J only in manner of mounting motor. * RD1175J Radials are the same as present models with the exception of Head Casting and Jackshaft Housing. Other parts are interchangeable. * J915 and model 4510 are identical with the exception of the 45A62 Hold Down and Guide Assy. The new assembly is interchangeable in its entirety. * The original document had these two serial numbers transposed. Here they are presented with the correct model number. * While several examples of serial number 13-639 have been entered into the Photo Index, none have been entered for 13-6390. This is probably a mistake or oversight in the original document. There has been only one change in sanders through all model numbers. This change is covered in the Service Bulletin dated May 21, 1958. * While several examples of serial number 12-240 have been entered into the Photo Index, none have been entered for 12J240. This is probably a mistake or oversight in the original document. Note: The formatting of the original document makes it unclear if P911 and P912 serial numbers were interchangeable, or if each model used specific serials. All jointers with Type 2 serial numbers were model P911-912. Model 6520-1 Jointers have serial numbers 0000001, 0000002, etc. Model 6520-1 Jointers have serial numbers 65-0001 and up. Note: The formatting of the original document makes it unclear if S1140 and S1141 serial numbers were interchangeable, or if each model used specific serials. All shapers with Type 2 serial numbers were model S1140. At the time of the number change, the 900 series models were altered slightly and then called the *4200 series. The 1100 series became the 4100 series. * Some 4200 series units were produced with an A. O. Smith direct drive motor. These proved highly unsatisfactory and were discontinued immediately. Some difficulties will arise on radial saw parts orders due to our lack of Parts Manuals and a lack of any manufacturing records. All orders for gearhead motor parts MUST include the “GB” number of the motor. This is our only positive identification of the motors since H.P etc....or manufacturer's serial numbers do not mean anything. Any questions on these machines should be referred to Headquarters Office. (Note: The preceding was kept intact purely due to the fascinating insight it provides into the service of these machines). All Model 8110, 8120, 8320, 8320-2 cut-off machines should have Type 4 serial numbers.